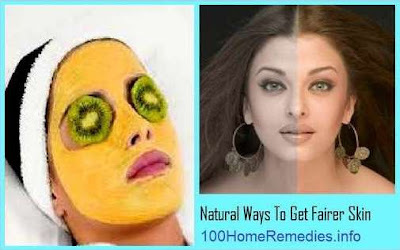 Many dark complexion people, mainly girls want to get a fairer complexion. Similarly, many fair skin people wish to change their skin to a dark tone. People who are of dark complexion at birth cannot be changed to fair skin, but still they can take proper care to get a fairer, glowing, flawless and smooth skin tone to look attracting and charming. No lightening cream or treatment can lighten your skin more than a shade or two. The complexion often become dark if one moves in direct sun light for long period of time because the intense sun rays tan the skin. So staying out of the sun will protect your skin from getting darker. The complexion can be improved or lightened your skin a few shades by using natural household things. Some common household ingredients like lemon juice, honey and cucumber are best to lighten skin tone. Best way to protect your skin from becoming darker is to protect yourself from exposure to the sun's ultraviolet (UV) rays. Exposure to the sun rays is main cause of the darkening and discoloration of your skin. try to remain indoors to keep your skin as light as possible. When going out, use sun cream with a SPF of 30, more is better. Also wear a hat to protect your face and proper clothes when you're outside. Lemon juice contains alpha-hydroxy acids (AHA) which is a powerful natural lightener acting as a exfoliate as well as a light bleach. It removes the upper layer of the skin to expose the lighter skin underneath. By bathing your skin in a lemon juice rinse, you can lighten your skin a little for a fairer complexion. Mix equal amount of water and fresh lemon juice. Apply this to your face, neck, arms and other parts of the body where you want your skin to become lighter. Rinse it off with warm water after 15 minutes and apply a moisturizer after that. Repeat 3-4 times a week. Mix some gram flour or oatmeal powder, a teaspoon of turmeric, and a few drops of lemon juice and rosewater to make a thick paste. Massage on your skin and leave it to dry. Rub your skin gently with the tips of your fingers in a circular motions to exfoliate your skin. The oatmeal or gram flour will scrub the top layer of dead skin, revealing lighter skin below. Mix turmeric with almond oil or olive oil to make a paste. Apply it to your skin and rinse it off after 15 minutes. Mix some cucumber pulp in yogurt and apply. Wash it off after 20 minutes width cold water. Make a paste by mixing papaya, milk, milk powder and honey and apply on face and leave fro 15 minutes, then wash. Apply a 1:1 mixture of cucumber juice and honey on the face and neck, chin and other parts which you wish to lighten. Leave it for 15 minutes and wash off. About 10 days later, Doly thanked me and informed me, "My complexion is now glowing. All my friends ask me the secret. You are like an Angel for me."